So, as some of you might know, I was recently looking for a viola, and bought one on Ebay. Now before I go on, I just want to make it clear that I am in no way trying to "plug"(?) a specific seller, or promote any seller. I thought it might be useful for some who is also looking for a new viola. I'm posting my thoughts on the Viola as an instrument, and not the seller. I bought this viola from Yitamusic on eBay, and I must say.... I am absolutely amazed by the its sound. The auction described the tone as Deep and Open, and that is exactly what it is. Warm, deep, soothing, open. I put new Warchal Karneol strings on right away, and it goes extremely well with this viola. The sound is loud, and the setup is great. The nut is very well shaped, the bridge feet fit to the instrument, and the soundpost is adjusted to fit to the arching of the viola. Overall I'm happy with the setup. I might, maybe, reshape the neck at some point, but might keep it as is. Still deciding. All in all, this was an absolutely excellent buy, and for the price, is a fantastic viola. I would say it is suitable for beginners, intermediate, advanced, and would even go as far as say it would suit a professional player. I'm not sure if I would classify it as a "Solo" instrument though, although someone who plays well could make it work. The varnish is applied well, and is not at all too thick, as you might see on some cheap instruments. The viola is 16.25 inches. Keep in mind, when buying a viola or violin like this, the bridge wont be on the instrument, and the soundpost will be down. Just saying. I will try to get a sound clip on tomorrow. Thank you for reading. Around a month ago I happened to exchange emails with a Bulgarian dealer, which eventually led me to buying this viola bow for the price of 300 dollars. It is a German made bow and weighs ~70.5 grams. It is branded "Otto Paulus" (I suspect this label is fake though), and I believe the winding and mount are silver. It seems to be in almost mint condition, which makes me question whether it is really 25 years old, like he stated. Either way, it caught my eye. How did i do? Does anyone perhaps have this sheet music, for viola, in the alto clef? I can only find versions in Treble and Bass clef, and unfortunately even though I can read both on the corrosponding instruments like Piano and Violin, I cannot put the fingers to the notes when playing the notes written in those clefs while playing viola. It was hard enough having to learn the alto clef, but now having to read Treble and Bass and Alto when playing viola seems a BIT harsh. Thank you. Some questions for teachers, students, employers, employees, masters, apprentices, etc. . . How do you keep track of progress? And how do you motivate it? I take notes in lessons, tracking repertoire, etudes, technical and musical issues. But I use the notes mainly as a reference aid. I try to tell students what they are doing right and doing wrong, what they have learned recently and long term, and what they should be thinking about "this week." I explain the value of slow practice and the metronome and etudes and scales and theory, but my students and I just write on their sheet music, they don't take notes. I have come to the conclusion that I need stricter measures to ensure adherence to a rigid practice schedule. I know a number of my colleagues make their students keep practice diaries. This is a more hard-nosed approach than is in my nature, but on the other hand, what's not to like about it? How do they work? Does anyone have any suggestions or experience with what [string music] students should include in their notes? Probably the same type of stuff I keep in my teaching notes. Hmm... PS: How do you do etude/scale/excerpt study? 1 per week? Should we memorize etudes? I've tried explaining the Zen of Scales to my students, but they just get glassy-eyed. Willow or poplar for small viola back? I am about to get started on making a small viola (15.5"). I am wondering what differences there are between using poplar and willow for the back. Any insight is greatly appreciated. Hi all, I'm currently a freshmen in college and have found the need to buy a new viola. My budget is currently around $5000, though I can go up a little more. Any thoughts? hello, i have a violin or viola made by mathais eberl. it has his name and also says lauten and eeigenmacher in salzburg anno 1673. the bow says bausett or baunett i think. they are in a large leather tube shaped case. any thoughts or opinions? thanks so much for the help. Passing info along from a fellow violist, Melissa Dunphy, in Philly. If not posted in the right place, please let me know and I will try to fix. 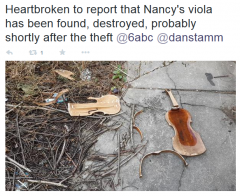 "My friend Nancy, a community member of the Penn orchestra, had her house broken into and along with three laptops HER VIOLA WAS STOLEN. I am utterly incensed on her behalf. I'm waiting on a better picture from her so I can post it on every social network I know, because surely if the internet can do anything, it can get this woman's viola back. In the meantime, here are some details from Nancy: A viola of French origin, possibly made by Cesar Pons, Paris, ca 1790, bearing a facsimile label: “Giovanni Grancino, Milan, 1696” Measurements: Body length: 40.4 cm Upper bout width: 19.2 cm Center bout width: 13.4 cm Lower bout width: 23.4 cm The peg box is distinctive in that the original holes were filled and new holes were drilled. John Safian of NJ did major repairs (gluing seams and cracks) last year, and his name is on the bridge. The bow is German and the stick was repaired up near the tip. The instrument was stolen Nov 30, 2014, between 6 and 8 PM; its empty case was found abandoned a couple of blocks away the next morning." I've been shopping for a year or so looking for a Baroque viola, and I finally stumbled onto one that I like. The thing is an enormous tenor (17.75"! ), but the short neck makes it easily playable. It came to me from the shop of Gabriela Guadalajara by a luthier named Christopher Bollman working out of Brooklyn. one day when I was practicing a noticed a slight buzz on my violas G string, open and fingered notes. I went ahead and checked the most usual suspects of buzzing ie the nut, bridge, strings, chinrest, tailpiece, fine tuners, shoulder rest, basically everything on the exterior of the instrument and could not find the source. I decided to let it sit for a night or two to see if it would go away. well, it did not. the next day I tried again and at first it sounded like the buzz had disappeared but soon after I finished warming up had it returned. this time, it buzzed not only on G but on C as well. I checked for open seams or cracks and could not find the problem. a few days later the buzz can sometimes jump to open D. I tried knocking my knuckles on the back of the viola and found that the knock sort of changes and I hear a slight vibration when I tap the back right side next to the right center bout. also when I knocked on the front next to the left corner of the fingerboard above the left f hole I got the same sound but nowhere else. after all that investigation I have no clue what this buzz is coming from. can anyone give me suggestions as to what it could be? I had been traveling the day before by plane, could that have caused something to unglue? sorry for the super long post but thank you! Complete Edit: Does viola vibrating string length correspond with viola body size? Or are the 2 different? Based on what do you choose the correct viola string length? Thank you. Hi there, I recently borrowed a friend's viola, which she isnt using anymore. It is a non-expensive Palitino viola, 15.5inches. Unfortunately, to me it sounds incredibly nasal, and overall not what Im looking for. I want to buy my own viola, but unfortunately, unlike violins, there arent that many Antique violas on Ebay for affordable prices, like I got my beloved German cottage-industry violin. Does anyone perhaps have experience with new violas, from Ebay, like the following ones? http://www.ebay.com/itm/2014-year-New-16-5-inches-viola-Ornati-style-No-4201-with-best-handcraft-viola-/321401043197?pt=LH_DefaultDomain_0&hash=item4ad4feb8fd http://www.ebay.com/itm/16-5-420mm-Mellow-Tone-Orchestra-Top-Favourite-VIOLA-plus-a-PERNAMBUCO-BOW-/181321497103?pt=LH_DefaultDomain_0&hash=item2a379a7a0f http://www.ebay.com/itm/Best-quality-16-5-viola-nice-flamed-maple-wood-back-sides-spruce-top-/360923362760?pt=LH_DefaultDomain_0&hash=item5408b575c8 http://www.ebay.com/itm/Attractive-sound-viola-16-bird-eye-wood-BD-156-/231203986830?pt=LH_DefaultDomain_0&hash=item35d4d4dd8e These are all pretty looking Chinese violas, which seems to already (some of them), be strung up with good strings aswell. If I buy one of these, and it sounds dreadful, I could always try regraduating the top plate, change the bass bar, or if the varnish is ultra-thick I could revarnish it myself, or whatever might be suggested. My other option is to buy a white viola on Ebay, and go from there. Since this is for myself, time and effort is no concerning matter, so I wouldnt mind having to work on it myself, and since the viola wouldnt have any antique value, I see no reason for using a better varnish (if needed, and if it comes to that). What do you think? Any suggestions? I would really like a smaller Viola, but I doubt I'll find a cheaper one that sounds great which is 15.5 inch, so I guess 16-16.5 inch is a safer bet. Anyone heard of viola maker Daniel Mason? Has anyone heard of the viola maker by the name of Daniel Mason? Last year I shipped in a very nice viola by him from Robertson and Sons in NM, but I wasn't able to buy it at the moment. When I called the shop they said that they receive the instrument sporadically on consignment, but they don't buy it from the dealer himself. Does anyone know of him or his instruments? When I google his name, the only somewhat-relevant results that pop up are pages about a professor of violin at the University of Kentucky, who I assume isn't the same person. Hi, My 12 year old daughter has been playing the viola for a few years. She has a test tomorrow on "shifting". She says she knows how to shift, but doesn't know how to read the music and how a shift is indicated. (She doesn't know what symbols indicate a shift, etc., etc.). Can anyone help her with this? I'll let her do the posting if she needs to explain this better ... thank you. Can anyone help date my Viola? The question arises because: 1. I have one viola (LOB: 435mm) with a pretty ‘forward’ kind of sound. The lower three strings sound great but…the A is really quite brash. 2. I have another (LOB: 444mm) whose sound is more mellow and balanced across the instrument, and the A is quite sweet. …which suggests to me that size alone does not necessarily dictate the character of the A string sound. 3. I am making a viola at the moment (LOB: 423mm). Sound….as yet undefined (currently working on the arching). Are there any measures that people can suggest to try to ensure the A string does not shout, and instead that its sound is in balance with the other strings? Thanks, Ed.